TEHRAN — Not participating in the 2012 London Olympics is a nightmare for every serious athlete, but for the Iranian women’s soccer team the defeat was extra bitter after they were disqualified right before a crucial qualifying match because they wore Islamic headscarves. Ready to play a crucial Olympic qualifying match with Jordan in Amman on Friday, the Iranian team was dismissed by officials of the international football association, FIFA. The officials decided just before the kickoff that the tight headscarves the Iranian players were wearing to cover their hair broke the association’s dress code, FIFA said on Monday. After Jordan was awarded a 3-0 victory, Iran’s players took to the field crying, Press TV, Iranian state TV’s English-language outlet, reported. In the Islamic Republic of Iran all women are obliged to cover their hair, neck, arms and legs according to the state’s interpretation of Shiite Islamic tenets. Female athletes who compete internationally have to obey the country’s dress code. Iranian women athletes have excelled during international events in sports such as karate and volleyball, but are notably absent from sports such as swimming and gymnastics. “This ruling means that women soccer in Iran is over,” said Shahrzad Mozafar, the team’s former head coach. She said that now that FIFA is no longer allowing Iranian women to wear scarves, the Iranian government will no longer send them abroad for competitions. “Headscarves are simply what we wear in Iran,” she said. In April 2010 FIFA announced that it was planning to ban headscarves and other religious outings during the 2012 Olympics. 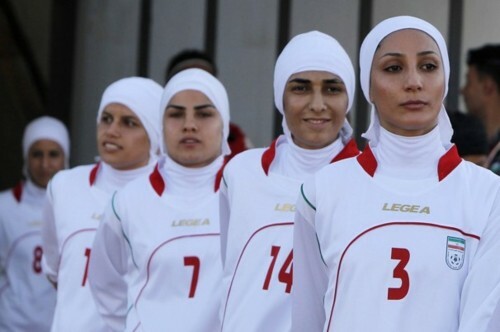 Following the ruling, Iran’s team designed special headscarves that players wrapped tightly around their heads and necks. The team said they were in line with guidelines set by the football association. FIFA did not agree and told the Associated Press on Monday that its officials had been right to stop the Iranian women from playing the qualifier. Iranian officials were “informed thoroughly” before Friday’s match against Jordan that the headscarf covering a woman’s neck is banned for safety reasons, an unidentified FIFA official said. The Iranian football organization, which is lead by allies of President Mahmoud Ahmadinejad, is planning to protest the ruling. Mozafar said the ruling killed professional athletic ambitions of Iranian women. “When a serious women athlete can’t participate internationally, which ambitions are left for her?” she said. Special correspondent Kay Armin Serjoie contributed to this report. This is Highly ridiculous! How appalling & embarrassing for the Olympic Committee. This is systemic racism @ it’s highest. The Olympics is supposed to be about Unity. This should not be allowed. This sets an extremely horrible precedent! When will we stop this stupidity? ← Vena Cava: More Imagination + Less Money = Good Style. Thank you so much. This is important. I’m really starting to get annoyed with people demanding that others take on appearances that defy moral constructs. The West is sad, sick, tired and cheap. And women should be protesting in mass that someone is working so hard to take away a woman’s right to be modest.